For my previous and first post on Fantasy Flight Games’ Star Wars: Edge of the Empire, go here. SW:EOTE uses unique, proprietary, colored dice for its task resolution system. There are “positive dice” and “negative dice”, meaning dice that you roll to reflect strengths and advantages your character has, and dice you roll to represent weaknesses and challenging conditions. Basically, if your character has a Skill, that Skill has an associated Characteristic. The Characteristics are the bare bones of a character in EotE, and Skills are, well, skills. Together, they determine the number of green Ability Dice and yellow Proficiency Dice you roll to accomplish things. If you have a significant advantage in the situation at hand, you might also add light blue Boost Dice. Together, those are the 3 kinds of positive dice. There’s purple Difficulty Dice for basic problems or resistance, black Setback Dice for unusual complications, and red Challenge Dice for big-time threatening situations. This assemblage of dice constitutes your dice pool for the situation at hand. You roll them and then start figuring out the results. I say ”figuring” because there’s some complexity to reading these dice. If you’re feeling lost, just ignore everything I’ve said so far, because it’s kind of irrelevant – which I admit is a weird thing to say, but I think it’s true. I will get into that more here, but mostly in upcoming posts on this topic. Success and Failure results are the most common, Advantage and Threat results are less so, and Triumph and Despair even less so. The basic guideline for reading the dice is that negative results cancel out positive results of the same level. So, each Failure result cancels a Success result, and each Threat result cancels an Advantage result. The number of Successes or Failures indicate how well or poorly you meet your goals for that roll. Advantages and Threats indicate short term side-effects or little twists to the challenge at hand, separate from whether you succeeded or not. Triumph and Despair results can turn the tide of a battle and dramatically change the nature of a situation. Some die faces have one symbol, some have no symbols, some have two of the same symbols, and some have two different symbols. If you’re a visual, tactile person like me, this means that when you see dice that cancel each other out you take them and put them away from the dice with meaningful results. Then (again, if you’re like me, you poor thing), if you have a die showing a Success and an Advantage on a single face AND a die showing a Threat, you want to rotate the die showing a Success and an Advantage until it shows just a Success symbol, since the Threat negates the Advantage but not the Success. Then you can read the dice. Make sense? Don’t feel bad if you’re confused – let’s take a look at a sample roll. Let’s pretend you rolled this. What does it all mean? Well, it’s complicated. One of those two Threats on that purple die cancels out the Advantage on that light blue die, so rotate the purple one until it shows only 1 Threat, and the light blue one is outta there! Also, The Failure on that black die cancels out one of the Successes on that yellow die, so rotate the yellow so it shows one Success and get rid of that black die. Hmm, that remaining Threat on the purple die could cancel the Advantage on that top-most green die that has two symbols on it, so rotate that green die until it shows just an Advantage and dump that purple die for good. Here’s your final result! 2 Successes and a Threat! Does that seem like a lot of work? It does to me. Naturally, some of all that becomes second nature after a while. Some people are able to just quickly “mental math” all that right off the bat or with some practice. I’ve been running the game for months, though, and this process still feels clunky. I can’t be the only one, can I? Don’t get me wrong: the dramatic dynamic of Success, Advantage, Triumph and Failure, Threat, and Despair is VERY pulpy and Star Warsy! I love it – I really do. However, I think the implementation is overwrought. So, next time I’ll start getting into some alternatives and how I want to re-write this game, both in terms of dice mechanics and how characters are built. The Shade first appeared in the Advanced Dungeons & Dragons Monster Manual II, published in 1983 by TSR, Inc. I don’t know what it is about this image. The simplicity and amount of black in the image leaves much to the imagination. There’s a strong suggestion of fierceness and determination in the figure’s stance and countenance, but also of brazenness: he has a helmet, sword, and shield – but no shirt! What’s his deal?!? Clearly he is not to be messed with. Subsequent editions of Dungeons & Dragons have elaborated upon and explored the Shade a bit. I’ve been a little obsessed with the idea of using the Shade as a player character race in a game for decades, and finally got around to it in my 13th Age game – possibly because making new races for 13th Age is so easy! 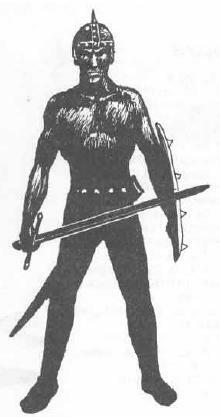 Of the four artists credited for interior art in Monster Manual II, my educated guess is that this image was drawn by Harry Quinn. Mr. Quinn is still keeping busy with Visual Rhythm Design and Harry Quinn Portraits. 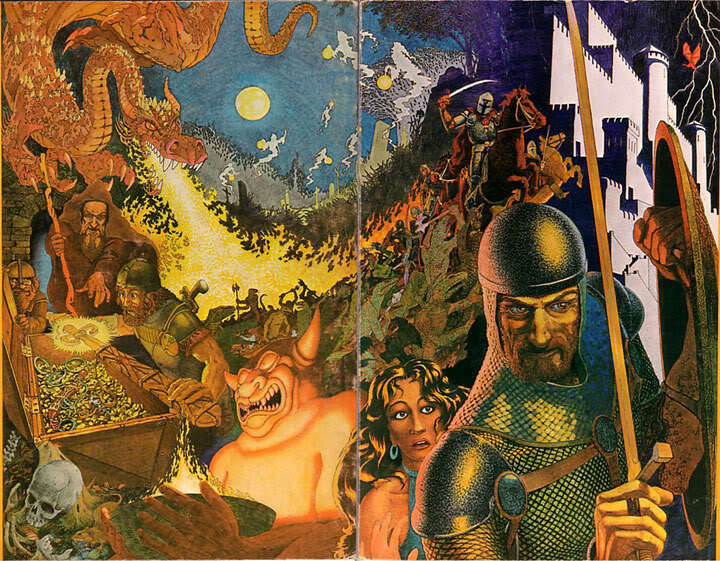 From the 1st edition Advanced Dungeons & Dragons Dungeon Master’s Screen, this is the player’s-side gatefold illustration by the late David A. Trampier. Let’s just say I spent WAY too much time in the mid-to-late ’80s facing whatever the Dungeon Master was cooking up on the other side of this screen. It’s a bit of a jumbly composition, but the foreground-right figure still looks cool to me, and the three figures huddled around the treasure chest is still delightfully evocative. Upcoming exhibition @ Gather in August!